My nails are still not the right length and my cuticles are still dry and wounded in some spots. However, I couldn't bear bare nails any longer. Fed up, I posted on Facebook this morning, calling upon my fans for what design to create. The respondent asked for flowers or blossoms of some sort, and since it has been absolutely gorgeous and sunny all day, I decided to do sunflowers. I'm pretty pleased with the results too. The base for this is Suzi Says Feng Shui (OPI). The petals were done primarily with Design Yellow (Color Madric), but then I added a tiny bit of Me First, a neon yellow from Sinful Colors. The seeds were dotted on using another OPI, Get in the Expresso Lane. After this manicure, it's one of mine too! I like this a lot! I've always loved sunflowers. I'm pinning this! BEAUTIFUL! 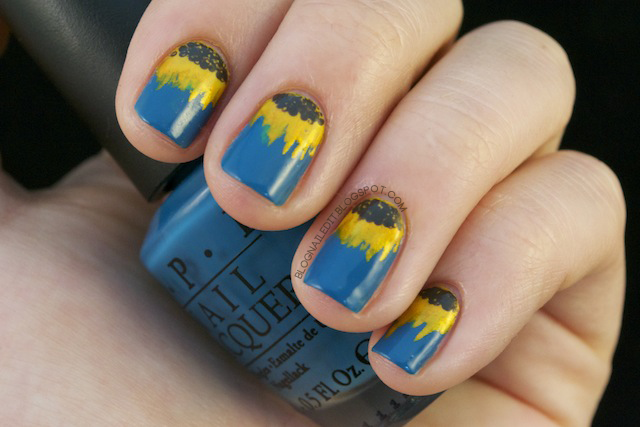 Looks sort of like an actual painting on you nails! Pretty! I love how you did the sunflowers! Oh thank you! What were you looking for originally? The dots you did recently, not the ones for Chalkboard's contest, the multi sized rows! OMG I looove these!!! These are so great! I'm seriously sunflower-obsessed ahhh!